73% users access to Machinery Marketplace are on mobile or tablet devices. Our eCatalog is optimized to serve both desktop and mobile devices to maximize reaching viewers. With over 50K active subscribers, your ads will be seen by thousands of potential buyers twice a month. Why wait? New sale leads will be sent directly to your registered email inbox. There is no middle man or no referral fee. 45% traffic coming to our eCatalog is from social media sites. The vast majority buyers use social media to search for equipment. You have full access to real time statistic tracking on number of viewers and clicks for better understanding your advertising campaign. 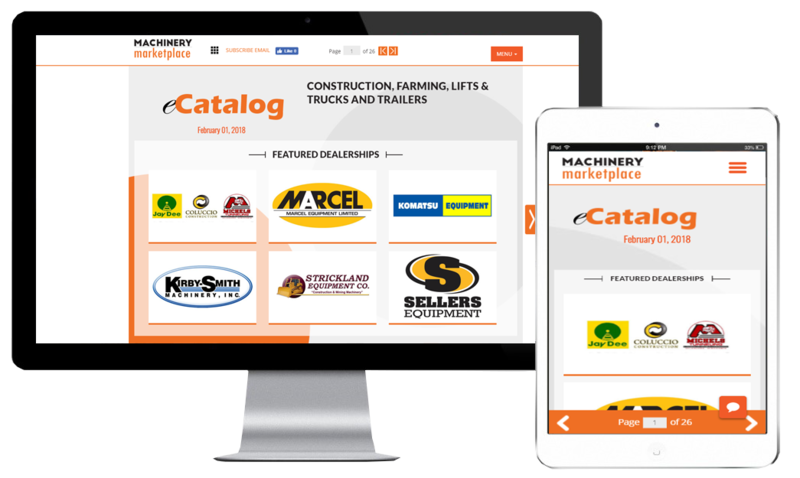 Direct links back to your equipment listing on Machinery Marketplace so buyers could see more of your equipment. This promotion is for new dealership members only: register today and post at least 10 items to get a full-page on our next eCatalog for free. No contract, no obligation. Buy ads with a minimum of 6 months, you will get 35% discounts from regular price. This is an unbeatable deal. Early birds deal: first 5 ad buyers on each eCatalog will get an adidtional of 10% discount from regular price.